In 1959, everyone wanted to go to Disneyland, even the cold war leader of the communist Soviet Union Nikita Khrushchev and his family. But it's tough to be a politician, and all magic comes with a price. Many sources reported that the visit actually happened, but unfortunately for the Khrushchev family, the Happiest Place on Earth turned out to off-limits to them. There is much speculation as to why the Khrushchev visit was ultimately canceled. Some sources cited Walt Disney's opposition to communism, but in fact, that was not the case. William H. Parker, police chief of LAPD, had left Disneyland off of Mr. Khrushchev's itinerary due to security concerns. Mrs. Khrushchev and the children, however, were scheduled to visit. 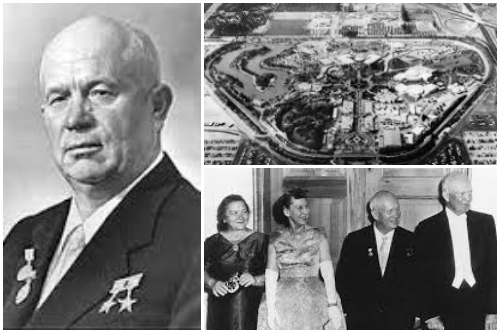 Just in case, two security plans were actually constructed - one for Mrs. Khrushchev and the children to visit Disneyland while Mr. Khrushchev toured Los Angeles housing projects and one for the entire family to visit Disneyland together. So what happened to those plans? Upon attending a luncheon at 20th Century Fox, Mr. Khrushchev learned of the plan for his tour of the housing projects and declared that he should also like to go to Disneyland. For still unknown reasons, the answer that he was given was that it was too great of a security risk to take him to Disneyland, even though a separate security plan already existed for just such an occasion. Mrs. Khrushchev, upset that her husband was being denied access to the park declared that she and the children would accompany the Premier on the tour of the housing projects instead. The only Russian citizens who ultimately visited the park that day were members of the Soviet news crew, who declared that they believed that Khrushchev's would have loved the experience.